Taking time to bond with your bird is essential to building a long-lasting and successful relationship with your pet. Birds are not domesticated and operate with a flock mentality, so forming a bond with your pet is crucial to helping him understand that you are his friend. The strength of the bond between you and your bird will greatly influence the quality of your pet's life, as well as your ownership experience. If you need help bonding with your bird, try these effective ways of helping shy birds warm up to you. They will likely help if you find that your relationship with your pet could use some work. Sharing your food with your bird is a great way to help him see you as part of his flock. In the wild, bonded birds regurgitate food for one another, so sharing a meal can go a long way in helping your bird realize that you mean no harm. 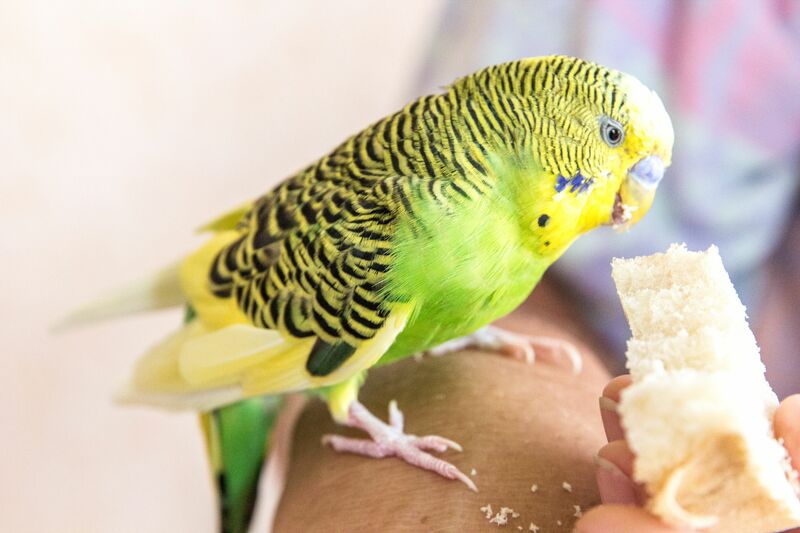 If you choose to offer your bird a tasty treat from your plate, make sure that the food you are sharing is free of salt and seasonings and is safe for birds to eat. If your bird is hesitant about trying a food at first, put a bite into his bowl and eat your portion in front of him. Speak softly and talk about how good the food is. Some birds, particularly those that have been rehomed or rescued, may not have had much exposure to humans during their lifetime. Worse still, some may have had very negative experiences concerning people. The best way to deal with problems like these is to desensitize the bird to your presence. If your bird gets nervous every time you come around, slowly start to take 5 to 10 minutes a day to sit near your bird and talk to him. Be careful not to make any sudden moves around the bird, and talk in a happy, animated voice. As your bird gets more comfortable around you, you can begin to spend longer periods of time with him. Grooming is the first thing in nature that forms a bond between families. Since the point of bonding with your bird is to get him to accept you as a family member, grooming can be a great way to get the message across if the bird will tolerate handling. If the bird will allow you to, try gently scratching the back of his head or helping him out with a few pinfeathers. Once your bird begins to trust you more, you may even decide to invest in a shower perch so that your feathered friend can join you in the tub! Wild birds have two main forms of communication: their voices, and body language. As bird owners, we can use this knowledge to help ourselves bond more closely with our captive pets. If it seems like your bird doesn't view you as much of a friend, then try singing some of your favorite songs to your pet and dancing around. It sounds a bit silly, but most birds can't resist joining in the fun. You may even want to play some of these popular songs about birds to help set the mood. One way to entice shy birds out of the cage to play is to bribe them. Try making up a batch of homemade bird toys and place some in your pet's cage for him to enjoy. Make notes of the ones that seem to be his favorites, and then try "decorating" your shirt with them while standing near an open cage door. This may help your bird see how much fun you can be, and is sometimes an offer that even very timid birds can't refuse.